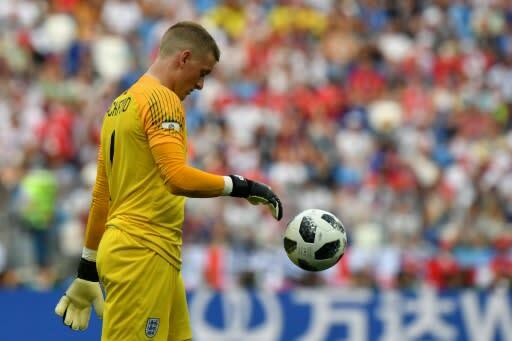 England goalkeeper Jordan Pickford says maintaining momentum at the World Cup is more important than navigating the draw ahead of Thursday's match against Belgium. Both sides have already qualified for the last 16 but, by finishing top of Group G, the winners in Kaliningrad could earn themselves a trickier route in the knockout stages. Germany or Brazil may be the quarter-final opponents for the team that tops the group, with Belgium coach Roberto Martinez suggesting he could rotate all 10 of his outfield players against England. "If that's how they feel it will make my job easier," Pickford said at England's training base in Repino on Tuesday. "If they don't want to score they won't have any shots. We're ready for them and we're ready to win the game as a group of lads. We want to finish top of the group." A draw would mean first and second place are settled on disciplinary points. England have two yellow cards to Belgium's three. Gareth Southgate's side are flying high after beating Tunisia in their opening game before thrashing Panama 6-1 on Sunday. "It's momentum and we want to keep that momentum going," Pickford said. "We just want to keep winning and winning. That'll put us in good stead." The introduction of the Video Assistant Referee system in Russia has sparked a dramatic increase in the number of penalties being awarded. Harry Kane scored twice from the spot against Panama while Pickford was beaten by Tunisia's Ferjani Sassi, despite touching the ball with his finger-tips. Pickford said Kane's two strikes, which both flew into the top left-hand corner, were virtually unsaveable. "They were pretty much, yes. You've got to do a lot of guessing," Pickford said. "With the power behind it and the accuracy, both penalties were exactly the same really. When Harry's finishing like that you've got no chance."